Vivec City is humongous and obnoxious to walk around. It has 8 neighborhoods, and each neighborhood is built up in layers, (up to) 4 strata per neighborhood. FORTUNATELY, Vivec City has lots of gondoliers that you can pay to take you over to the other neighborhoods (which is a lot faster than walking). UNFORTUNATELY, the gondoliers are only on the canal works (bottom) level for obvious reasons, and it is a pain running down 3 flights of stairs (or even levitating down 3 flights of stairs) to get to them. Sometimes I levitate down, but more often than not I just jump down when I see them. I do this because I am lazy, and because I know I will survive. But only just! A fall from that height ALMOST kills me and I am super damaged, but it doesn’t quite kill me! Still, I must look a wreck and the gondoliers must think I am super weird. 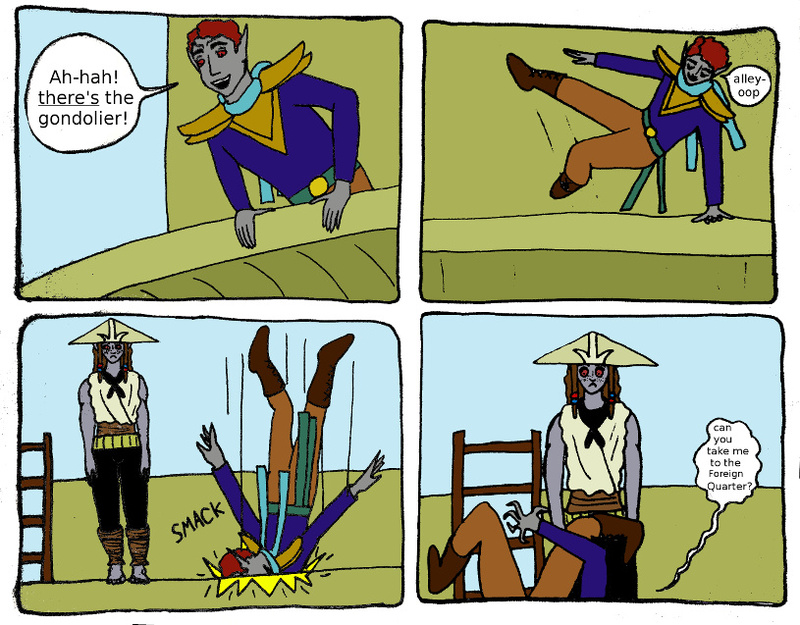 This entry was posted in Art, Doodles, Gaming, Videogames and tagged comic, Dunmer, Morrowind, Nerevarine, Vivec. Bookmark the permalink.